ULTIMATE SUMMER SPREAD Clockwise from upper right: A selection of wines and beers from Vendome Wine & Spirits; old-fashioned lemonade from Lemonade; spicy quinoa salad from Sweetsalt Food Shop; peach, burrata and arugula salad from Romancing the Bean; spicy chicken bowtie pasta salad from Olive & Thyme; meat and cheese party platter from Village Gourmet Cheese & Wine; blood orange lemonade from Lemonade; fried chicken and short rib sandwiches from Olive & Thyme; and raspberry, pistachio and caramel fleur de sel macarons from Lemonade. Food styling by Denise Vivaldo and Cindie Flannigan, denisevivaldogroup.com. Photo by Daniel Deitch. 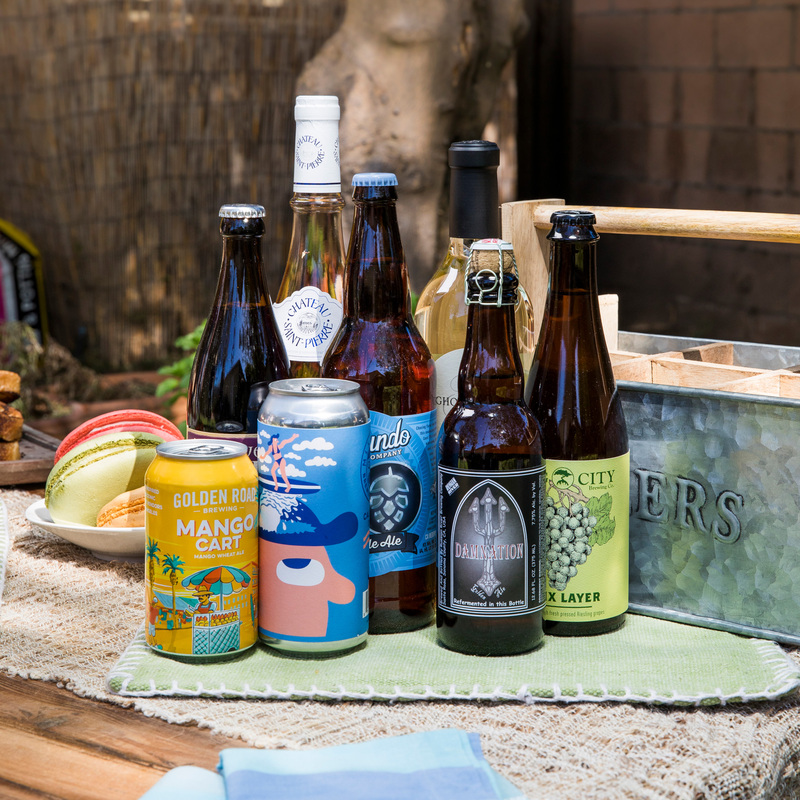 The growing popularity of artisan prepared foods is a boon for picnic-goers, making the task of filling your basket a breeze. Village Gourmet Cheese & Wine in Tujunga Village offers picnics for one or two with regional international themes including Tuscan Picnic, All-American Picnic and the sublime French Country Picnic, featuring alpine ham and truffled mousse paired with a selection of French cheeses, baguette, olives, cornichons, grapes and gourmet chocolate chunk cookies. Go next-level elegant with their selection of chic coolers and totes from Picnic at Ascot, a family-owned business based in Southern California that specializes in British-inspired high-end picnic accoutrements. When it comes to homemade, family-friendly and fresh, HoneyBaked Ham is a local favorite. The Toluca Lake location has been in the Dolfuss family for three generations and prides itself on having served the community for the past 40 years. Beyond their namesake award-winning pre-cooked hams, they offer a full menu of custom sandwiches, ready-to-eat pork ribs and baby back ribs, and cookies baked daily on premises. You can pick up a boxed lunch that includes a sandwich, a side salad, a bag of chips and a drink. Satiate both your sweet and savory tooth at Sweetsalt Food Shop in Toluca Lake, a café and bakery where you can enjoy the small outdoor patio or grab an entrée and dessert to go. 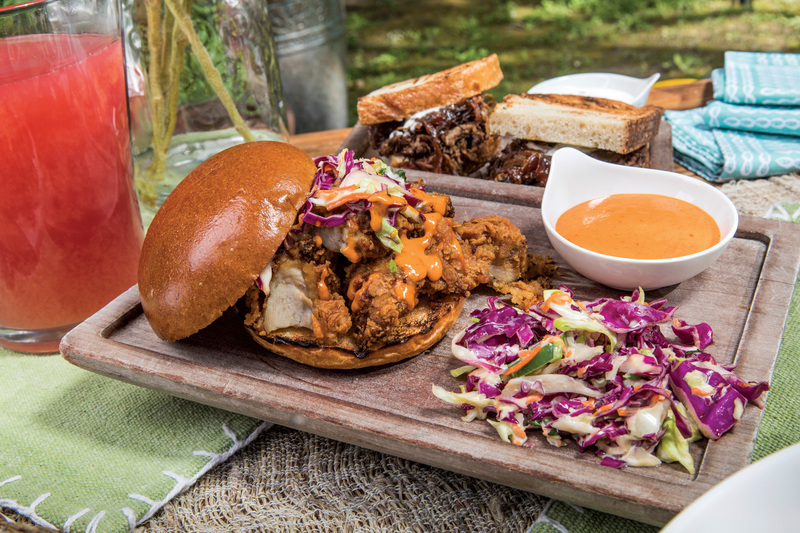 The website describes the menu as “Seasonal American with a hint of French and Basque Spanish, revolving around the use of fresh, seasonal ingredients.” What that means for your picnic is unique sandwich and salad options like the shrimp po’boy or a fig and bleu cheese salad with candied walnuts and fennel. Finish with a sweet and savory twist by adding a slice of berry rosemary cake or lavender lemon shortbread to your basket. SALAD DAYS Sweetsalt’s champagne chicken salad includes chicken, grapes, celery, cucumber and shallots in a champagne and goat cheese dressing. Photo by Daniel Deitch. CHICKEN WITH A KICK Olive & Thyme’s fried free-range chicken sandwich comes with spicy jalapeño coleslaw and harissa aioli on a toasted brioche bun. Photo by Daniel Deitch. An assortment from Village Gourmet Cheese & Wine. Photo by Daniel Deitch. 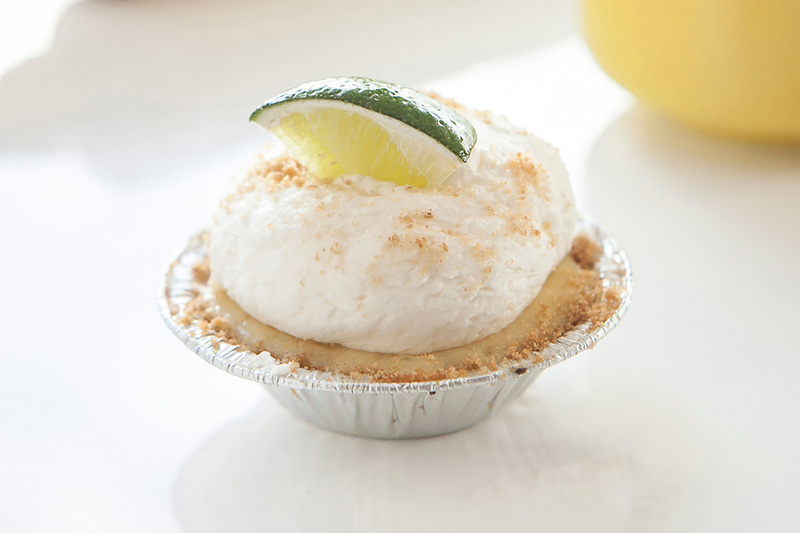 Key lime cutie pie from Simplethings. Photo by Daniel Deitch. 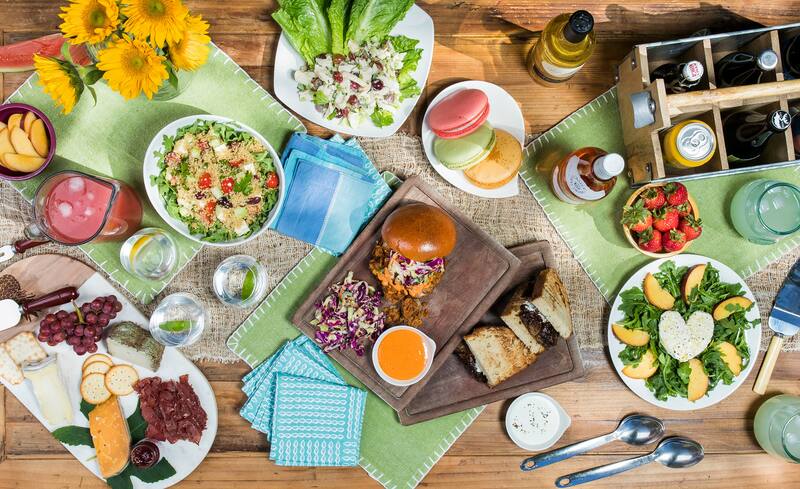 At Burbank favorite Olive & Thyme, fill your picnic basket with a sumptuous selection of organic sandwiches, salads, cheeses, charcuterie, wine and beer. Owners Christian and Melina Davies insist on quality and freshness: “We receive new product every morning straight from local farms and vendors. Nothing is prepackaged or left over from the previous day, and everything we do is made from scratch.” Picnic boxes include a salad, sandwich, cookie and bottled water. Choose from creative selections like the popular braised short rib sandwich with horseradish crème fraîche, and a seasonal-for-summer poached egg and butter lettuce salad made with fresh open pea pods, avocado and watermelon radishes dressed in a light green goddess dressing. Simplethings in Burbank accommodates the local lunch crowd’s demand for high-quality to-go meals delivered quickly in both small and large quantities. Choose from an array of sandwiches and salads for your picnic, and don’t forget to pack dessert — Simplethings is known for its rotating menu of homemade, seasonally based pies, also available in a miniature “cutie pie” size. Past summer selections have included Key lime and Meyer lemon. Just a few blocks west on Riverside, Lemonade is another hot lunch spot offering fresh carryout salads, sandwiches, bowls, sweet treats and, of course, an array of lemonades. Also in Burbank is Romancing the Bean, a café and coffee shop that has fed and caffeinated the local community since 1993. 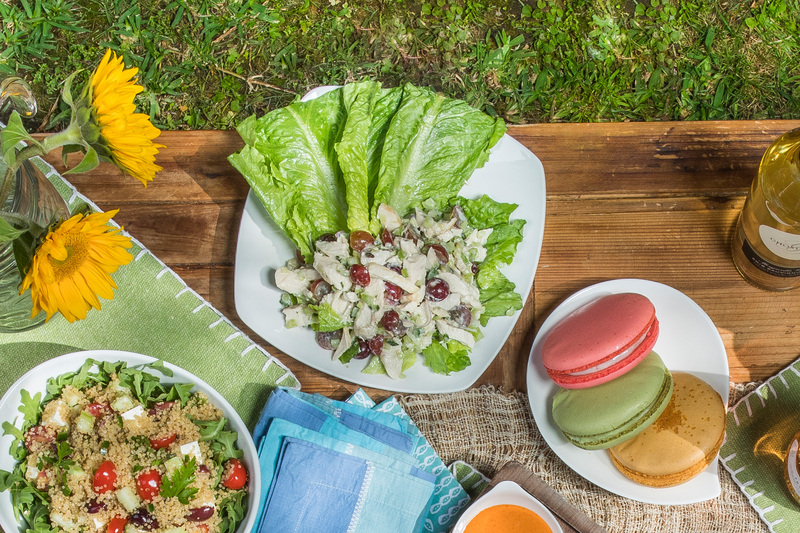 With a focus on local and organic ingredients, Romancing the Bean offers summer picnic-perfect fare like the refreshing peach and burrata salad, a cold Nicoise salad, and a brie and apple sandwich. Celebrity and local favorite Joan’s on Third, with an outpost in Studio City, perfected the New York deli-style formula of offering a mix of upscale prepared and to-order items that may be enjoyed on site or packaged to go. Order an entrée from the special picnic menu and receive a box complete with bread and butter, salt and pepper, utensils, napkins, cups and plates. 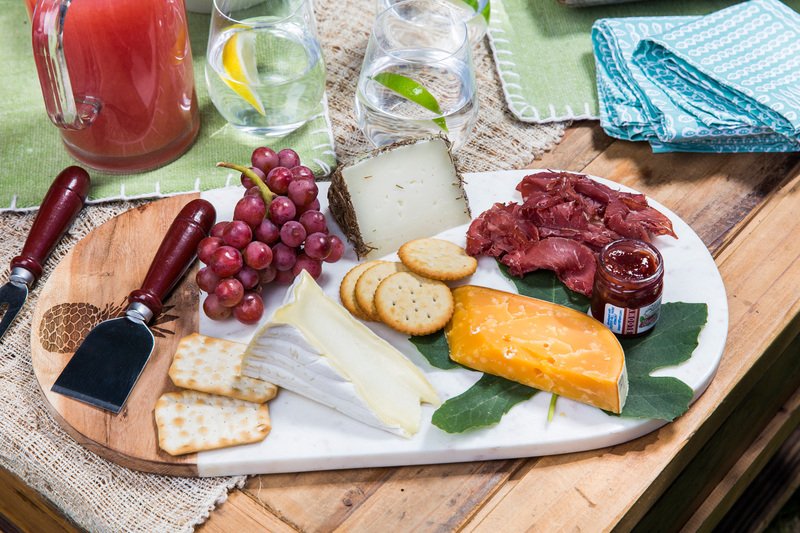 Or, for a lighter meal, skip the entree and fill a picnic box from the abundant selection of prepared foods, cheeses, charcuterie, pastries and sweets. Whether enjoying a picnic among family and friends, or dining under the stars with your sweetheart, may this summer be your best yet. Cheers! An assortment from Vendome Wine & Spirits. Photo by Daniel Deitch. There was one common theme among the wine and spirits shop owners we spoke with when it comes to summer drinking trends: Rosé is still queen of summer, and she shows no sign of relinquishing the throne. As Shelley Janson, owner of Artisan Cheese & Wine, puts it, “Summer months are for drinking rosés … they are pink and romantic and sweet!” Her charming Studio City shop serves hand-selected wines complemented by spectacular cheese boards and classic café fare, including picnic-friendly salads and sandwiches. The Toluca Lake location of family-owned Vendome Wines & Spirits has been serving the local community since 1987. David Milligan, wine buyer and director of special events, offers ideas for picnic beverages: “Try something new and exciting, like a Grand Cru Beaujolais from Moulin-A-Vent, a relatively light and delicious, slightly fruity red wine that can be served with a slight chill.” Also check out their seasonal beer selection of blonde ales and crisp sours, perfect for a hot summer day.